Tomorrow morning, Emily and I fly down to New Orleans for this year’s Jazz Fest. This is an event that I have been itching to attend for years now. As a college student in Atlanta, I spent several weekends and breaks over in the city and it quickly became one of my favorite places to visit in the country; however, Jazz Fest always coincided with the end of the semester and finals. Despite the festival always falling on my birthday, finals were the one time I could not manage to sneak away from school for a weekend of fun. This is my first time returning post-Katrina and I anticipate some disappointing changes; however, I still expect to experience a vibrant and rejuvenated French Quarter still glowing in the aftermath of the hometown Saints’ Super Bowl triumph. 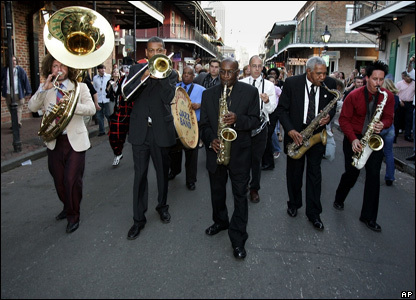 New Orleans is a truly American city with its blend of French, Spanish, English, African, Cajun and Creole cultures. This cultural “melting pot” resulted in one of the finest and most uniquely American cuisines, as well as the invention of the inspiration for this particular festival–jazz. I look forward to thoroughly enjoying both. As this is Jazz Fest, I am most excited for the music. This weekend I will surely enjoy Levon Helm’s return to singing, My Morning Jacket, the Allman Brothers, Simon and Garfunkel and of course, a whole slew of New Orleans favorites including the Funky Meters and Galactic. Unfortunately the schedule gods refused to cooperate with my intentions in putting My Morning Jacket’s slot opposite Simon and Garfunkel’s as the Saturday evening headliners demanding that I either split myself in two or allocate some sort of division of time between their respective stages. We shall see how that plays out in real time. Although I am most excited for the jazz, I also cannot wait for the food. We already carved out an extensive culinary tour of the city taking us from some local funky favorites like Camellia Grill and Mothers’, to some fine dining like Restaurant August (it’s my birthday so I do have to indulge!). While on vacation posting will be sparse and I will definitely fall behind on the news-flow, but I will try my best to give some quick reviews of favorite places, people, food and music experienced throughout the week. Following my return, come back over to check out my observations and feelings with regard to the city’s post-Katrina resurgence (and/or continued difficulties), as well as my reviews of the music, food and good times. See you on Bourbon Street!